Heat pan, add all ingredients one by one & Dry roast. Grind to fine powder . Useful Post Sri..I use the store bought ones..Thanks for sharing..
You give us such lovely basic recipes that we could build on... very smart girl! 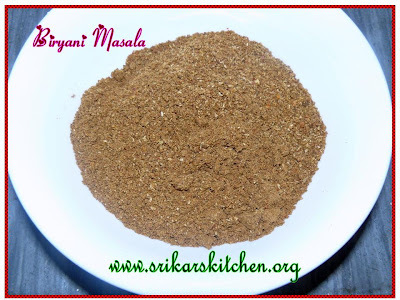 Hai srikar nice post i never tried biryani masala .I use store bought only.I only prepare sambar ,rasam some curry powders.Thank for the post i will try this. Good one! thnx for sharing with us. Wow nice one Sri... Sure it will come handy to make that quick do lunch for unexpected frenz!!! should try this masala too..always used the store bought ones for biryani..
Homemade Biryani masala...sounds interesting...will give a try sometime. good and useful post really, thanks! Mmm nice post..! Will try out! Very useful and lovely recipe. Good to make homemade masala then the store bought ones. I can smell the aroma from just looking to the pic, well i wish i could smell the delicous aroma of the spices. Sounds spicy and aromatic... But i never use any biriyani masala for my recipe... Will try this!